We will be accepting Credit/Debit cards for ticket purchases by phone and in the office. The 42nd edition of the renowned oldest continuous bull riding in the world, the George Paul Memorial Xtreme Bull Riding will bring a who’s who in the bull riding world April 26 & 27, 2019 at 8:00 P M nightly to the Val Verde County Fairgrounds. Three PRCA World Champions representing 10 bull riding World Championships are ready to compete. Reigning World Champion Bull Rider Sage Kimzey, who just won his fifth straight PRCA bull riding world title will ride as well as four-time PRCA World Champion Bull Rider J.W. Harris. Riders from 17 states and Canada will vie for the coveted George Paul Memorial Bull Riding championship buckle. 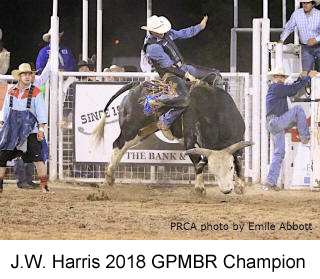 Harris who won the 41st George Paul Memorial Xtreme Bull Riding last year also won the George Paul in 2011. Cody Teel, a 2012, PRCA World Champion bull rider will also compete and was the George Paul Champion in 2015. Del Rio crowd favorite Trey Benton III, known as TB III, will be gunning for his fourth George Paul championship buckle having won the event in 2013, 2014 and 2017. Benton was the 2017 reserve World Champion bull rider and this year captured the Xtreme Riding title in San Antonio during the San Antonio Stock Show and Rodeo. Of the top 15 PRCA bull riders in the world in current rankings, 14 will compete at this year’s George Paul. 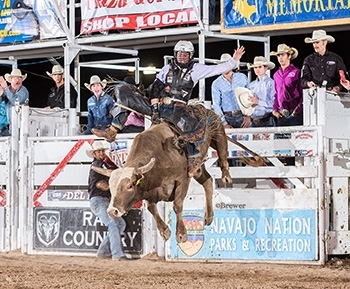 Over 70% of the top fifty in the PRCA bull riding rankings will compete at the two-day event. Each rider receives one bull and the top ten each night receive a second bull. Forty different riders compete each night and the top score on two bulls from both performances wins the event. Fifty thousand dollars in prize money is paid out during the two-day event and all money won counts for qualification for the PRCA’s Wrangler National Finals Rodeo held in Las Vegas in December. Known as the “Superbowl” of professional rodeo, the ten-day Wrangler National Finals Rodeo pays ten million in prize money over ten days. Rafter G Rodeo Company of Terrell, Texas, is the primary contractor for the 42nd George Paul Memorial Xtreme Bull Riding once again. 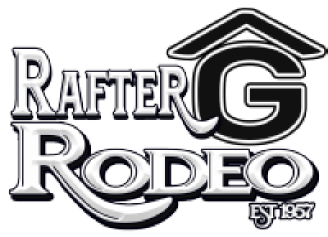 Rafter G is owned by the Neal Gay family and has produced rodeos since 1957. Neal Gay brought professional rodeo to the television market with his weekly Mesquite Championship Rodeo. Neal Gay is 90 years old and still rides at every performance of the Fort Worth Stock Show Rodeo which he has produced for over 40 years. Jim Gay now runs the daily operation of his father’s business and has been in the production end of rodeo since retiring from competition as a bull rider and steer wrestler over 20 years ago. Wife Brenda, his wife and high school sweetheart handles the office for the rodeo company and daughters Megan and Summer are actively involved in the daily ranching and rodeo business. The 42nd George Paul Memorial Xtreme Bull Riding is named for the 1968 RCA World Champion Bull Rider, George Paul, of Del Rio, Texas, a world record holder of riding 79 consecutive bulls and National Finals Rodeo bull riding winner. The event producer is George Paul’s brother, Bobby Paul. 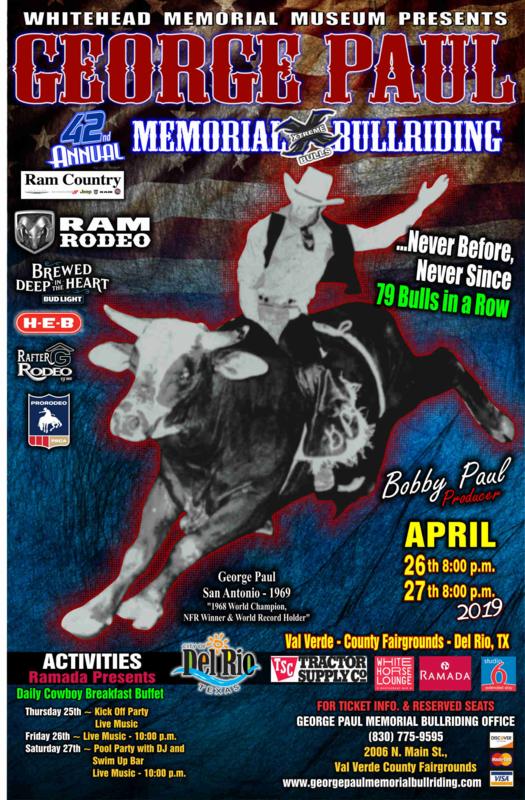 Sponsors for the 42nd George Paul Memorial Xtreme Bull Riding are Ram Country and Ram Rodeo, Bud Light, City of Del Rio, HEB, Tractor Supply, Val Verde Regional Medical Center, Ramada Inn and the Whitehead Memorial Museum. Tickets may be purchased at the George Paul Memorial Bull Riding office, 2006 N. Main at the Val Verde County Fairgrounds or by calling the bull riding office at 830-775-9595. 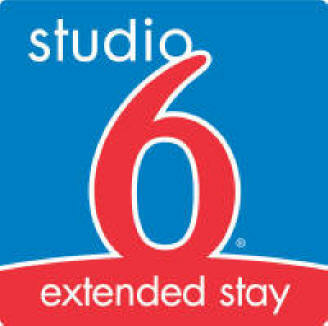 Discover, Master Card, Visa, American Express and debit cards will be accepted. 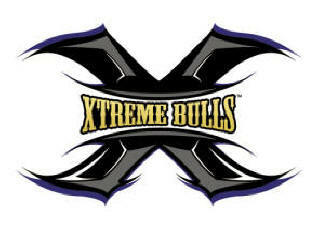 Check out updates for the 42nd George Paul Memorial Xtreme Bull Riding at www.georgepaulmemorialbullriding.com. Western Horseman, a western horse and western lifestyle magazine will feature an article about the George Paul Memorial Bull Riding in its April edition, which will be out the third week of March. Established in 1936 in San Francisco, the now Fort Worth published magazine has a readership of 500,000 with paid subscriptions of 163,000. Over 410,000 Facebook fans visit the magazine each month and they are fast growing on Twitter. George Paul producer, Bobby Paul, was interviewed for the article as well as historical research by the author. Look for another publication that recognizes the oldest continuous home of standalone bull riding in the world, now in its 42nd year. Trey Benton III, three-time George Paul Memorial Bull Riding Champion has won the San Antonio Stock Show/ Rodeo Xtreme Bull Riding, pocketing $35,250 for his efforts, February 23. The Rock Island, Texas cowboy, is now 27. His final bull of two for the SASSR was a bull he was familiar with, Monte Walsh, owned by 4L & Diamond S Rodeo Company of Weatherford, Texas and Summerville, GA. The bull Monte Walsh was one of the bulls bucked at the George Paul last year and has also appeared at the Wrangler National Finals Rodeo. 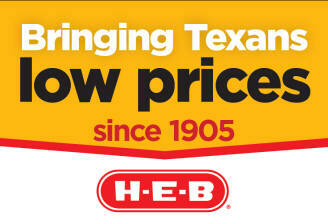 He will return to Del Rio again this year. Known as a “money bull” if you can last 8 seconds, he is a bull that riders like to draw at rodeos and on the Xtreme Bulls Tour events. Benton will return to the 42nd George Paul Memorial Xtreme Bull Riding April 26 & 27, 2019 in Del Rio, TX, a PRCA Xtreme Bulls Tour event. Money won at the George Paul counts for qualification for the Wrangler National Finals Rodeo in December where only the top 15 PRCA bull riders qualify for a chance to win money, 10 million at the ten- day event. When asked earlier this year if he was returning to the George Paul he said, “without a doubt. I want to be the first four-time George Paul winner”.